Global temperatures in 2018 were 0.83 degrees Celsius (1.5 degrees Fahrenheit) warmer than the 1951 to 1980 mean, according to scientists at NASA’s Goddard Institute for Space Studies (GISS). The 2018 global temperature average ranks behind 2016, 2017, and 2015. The past five years have been the warmest years in the modern record, and 18 of the 19 warmest years have occurred since 2000. 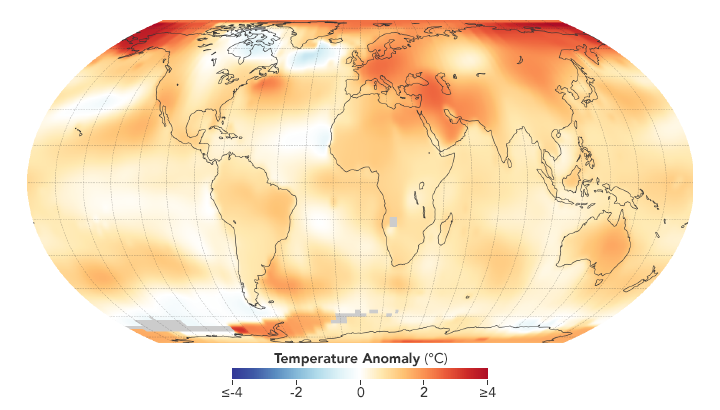 The map above depicts global temperature anomalies in 2018. It does not show absolute temperatures; instead, it shows how much warmer or cooler each region of Earth was compared to a baseline average from 1951 to 1980. This animation shows the seasonal cycle in global temperature anomalies for every month since 1880. Each line shows how much the global monthly temperature was above or below the global mean from 1980�2015. The column on the right lists each year when a new global temperature record was set. These seasonal anomalies are drawn from the Modern-Era Retrospective analysis for Research and Applications, version 2 (MERRA-2), a model run by NASA�s Global Modeling and Assimilation Office. Weather dynamics often affect regional temperatures, so not every part of Earth experiences similar amounts of warming every year. For instance, NOAA found the 2018 annual mean temperature for the contiguous 48 United States was the 14th warmest on record. Warming trends have been strongest in the polar regions, where 2018 brought a continued loss of sea ice. Warming also accelerates mass losses from the Greenland and Antarctic ice sheets, which adds to sea level rise. Increasing temperatures can also contribute to longer fire seasons and exacerbate some extreme weather events, according to Schmidt. NOAA scientists used much of the same raw temperature data as NASA, but with a different baseline period and with different interpolation into the Earth’s polar and data poor regions. NOAA’s analysis found 2018 global temperatures were 0.79°C (1.42°F) above the 20th century average. This line plot shows yearly temperature anomalies from 1880 to 2018 (using the 1951-1980 mean) as recorded by NASA, NOAA, the Japan Meteorological Agency, the Berkeley Earth research group, and the Met Office Hadley Centre (UK). Though there are minor variations from year to year, all five temperature records show peaks and valleys in sync with each other. All show rapid warming in the past few decades, and all show the past decade has been the warmest. NASA’s temperature analyses incorporate surface temperature measurements from 6,300 weather stations, ship- and buoy-based observations of sea surface temperatures, and temperature measurements from Antarctic research stations. These raw measurements are analyzed using an algorithm that considers the varied spacing of temperature stations around the globe and urban heat island effects that could skew the conclusions. These calculations produce the global average temperature deviations from the baseline period of 1951 to 1980. Because the locations and measurement practices of weather stations change over time, there are uncertainties in the interpretation of specific year-to-year global mean temperature differences. Taking this into account, NASA estimates that the 2018 global mean change is accurate to within 0.1 degree Fahrenheit, with a 95 percent certainty level. 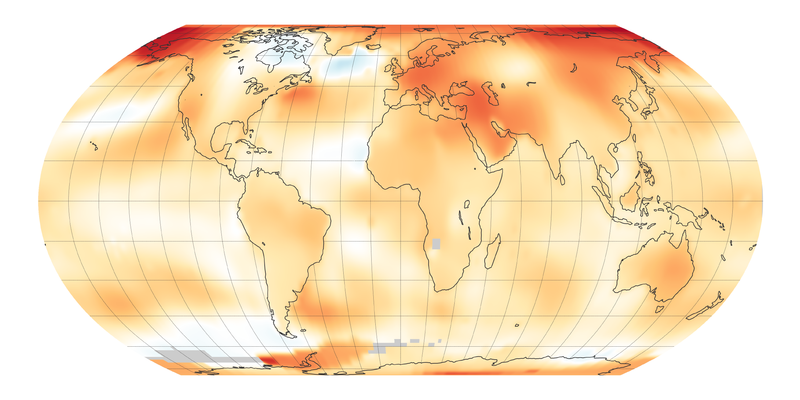 NASA’s full 2018 surface temperature data set and the complete methodology used to make the temperature calculations are available online.